In Canada, campgrounds are classified according to the number of services (hookups) they offer. This information is important because you will be asked for the number of services you want when you book your camping site. 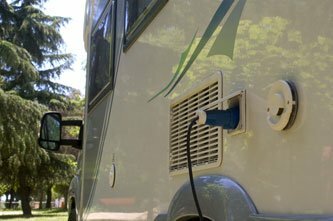 A power source is required to run all of the electrical equipment in the RV such as lights, outlets, microwave, fans, heating, air conditioning, etc. All RVs are equipped with a (usually 12V) DC battery that enables the electrical systems to function without being plugged into a power source. You can easily run off the battery for 24 hours, and up to 48 hours if you are careful. The battery is charged by running the engine. Driving for one hour is enough to completely charge your battery. Important note: The DC battery is not powerful enough to run certain appliances such as microwaves and air conditioners. To use these appliances, you will need to be plugged into a power source or use a generator. A water hookup provides the RV with water for showers, doing the dishes, etc. An RV's fresh water autonomy depends on the capacity of its water storage tanks. In general, you should be able to spend 2 or 3 days without a water hookup if you are carefull. Each time you are hooked up to a source of water, be sure to top up your storage tanks. Most campgrounds have a water station where you can fill your storage tanks for free. Advice: We recommend buying bottled water for drinking. Water tanks can easily become contaminated. Grey water is the water that drains from the sinks and shower. Black water is the water from the toilet. Grey water and black water are not stored in the same tank, which is why we are making a distinction between them. Autonomy with regard to waste water depends on the capacity of the storage tanks. Generally, you can go for 24 to 48 hours without emptying the tanks, depending on your water consumption. Even if your camping site does not have a sewer hookup, there is almost always a dumping station near the campground exit. If not, many tourist information centres have a waste water dumping station. TIP: Always dump the black water first, so that the grey water can rinse the hose. What is included with the bedding and kitchen equipment?